Over the last several days, the entire world's attention has been drawn to the city of New York, where protests have pulsed since a Staten Island grand jury decided not to indict Daniel Pantaleo, the NYPD officer who executed a fatal chokehold against unarmed 43-year-old Eric Garner back in July. 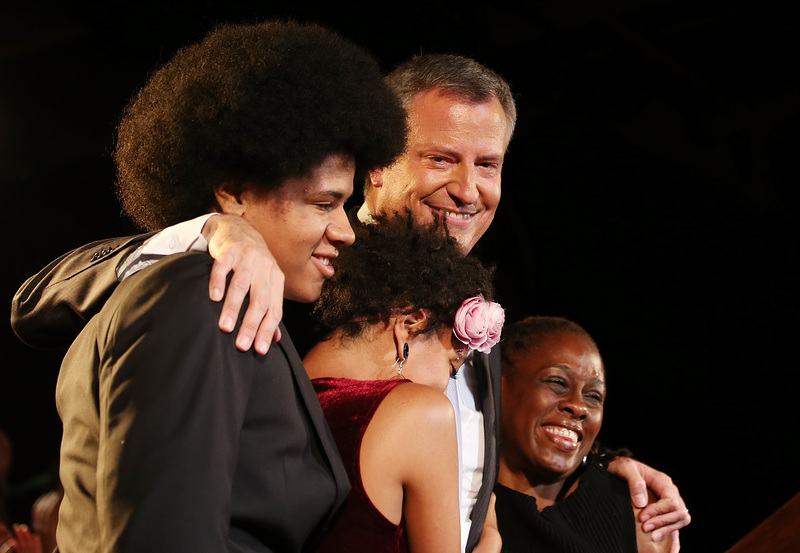 With large-scale acts of protest against police violence choking city traffic and dominating the national awareness, New York City Mayor Bill de Blasio has spoken out on the tumult, and on ABC's This Week Sunday, he shared a particularly upsetting story — de Blasio's police advice to his black son Dante is heartbreaking. It's a conversation that's painfully familiar parents of black and brown children in cities across the country, so much so that it has it's own cryptic shorthand — "the talk." In simplest terms, it tends to go like this: be careful when you're dealing with a police officer. Don't challenge them, don't make any sudden movements, don't assume anything like an aggressive or assertive posture, especially if you might be arrested. The reason for all this is clear: the terror, cut from a cloth of awful incidents like Garner's, that either implicit or overt racial bias by a police officer could get a person of color needlessly killed. This is a particular hazard for young black children, who were found by research from the American Psychological Association to be perceived as older and more threatening than their same-age white counterparts. This is a phenomenon which may have been in play in the fatal shooting of Cleveland 12-year-old Tamir Rice in November, as police initially radioed in that they believed Rice to be "maybe 20." De Blasio discussed his talk with Dante to ABC's George Stephanopoulos Sunday, and it echoes the conversations which countless parents have discussed having with their children of color. What parents have done for decades who have children of color, especially young men of color, is train them to be very careful when they have a connection with a police officer, when they have an encounter with a police officer. It's different for a white child. That's just the reality in this country. And with Dante, very early on with my son, we said, look, if a police officer stops you, do everything he tells you to do, don't move suddenly, don't reach for your cell phone, because we knew, sadly, there's a greater chance it might be misinterpreted if it was a young man of color. What's particularly heartwrenching about this, beyond the tragedy that any parent has to have such a talk with their child, is how vital a conversation it is even for the mayor of America's biggest city. The thing about implicit racial bias is that you can't expect to escape it just because you have a successful or powerful parent — it's all about what assumptions somebody layers onto you based on the color of your skin, and how that spurs their thoughts, fears or reactions. As the father of two black children, Mayor de Blasio is in a position that's by no means uncommon throughout America, but gives him a unique and hopefully helpful sensitivity to these issues among white political leaders. After all, he campaigned against the NYPD's highly controversial and, by the numbers, highly racist Stop and Frisk policy. There are also, however, some places where a sense of mayoral discretion might prohibit him from commenting in-depth — he declined to say whether he agreed with the grand jury in the Garner case, instead saying he "respected the process."